There are times when Windows or macOS application, software or program is running slowly, and there is a need to enhance the performance of your device. The best way to have your PC at its best performance is to download, install and run a clean/speed up applications. iTunes, on the other hand, is known for managing iOS media files and application. However, running iTunes usually result in errors that tend to cause data loss and unpleasantness in using the software. Using iTunes cleanup tool would be helpful in removing damaged or corrupted files from iTunes for better experience. CleanMyMac 3 is a simple and useful application for keeping your Mac clean, maintained and healthy. It’s known for optimizing users experience on Mac by scanning every inch of your system, removing gigabytes of junk files and monitoring the health of your Mac. 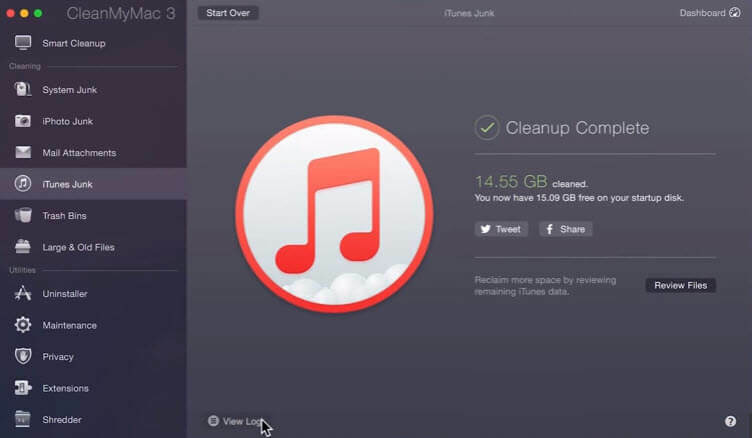 One of its special feature called iTunes Junk is to clean up iTunes. It will cleans out all sorts of junk files in iTunes that most users don’t notice. Has the capacity to clean hidden iTunes junk files that most people don’t know exist in the Mac. Remove outdated iOS device backups. It keeps the latest versions of iOS device backups while erasing the rest. Broken Downloads that were not completed in iTunes can be easily located and erased. Also erase old software updates in iTunes to make space for more apps and files. Copies of iOS apps stored on your hard drive can be scanned and deleted. Fairly scans your Mac for iTunes junks in order to erase them. Fairly speeds up your Mac and iTunes. Not affordable to many macOS users. It doesn’t provide Windows version, which keeps Windows users away. It does not offer deep cleaning for iTunes junks. It should supports more file types to clean because there are lots of other junk files stored in iTunes. 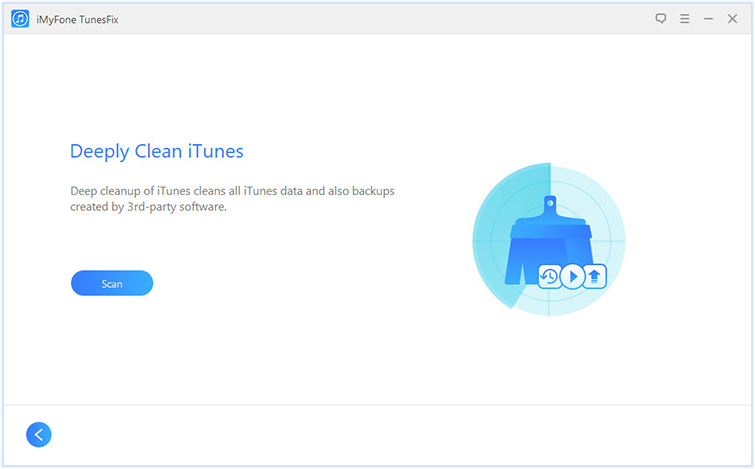 CleanMyMac helps in cleaning iTunes junk without hansle, but its functions are not perfect. What’s more, its Windows version doesn’t have the feature to clean iTunes. So it’s a good news for you that you can take advantage of iMyFone TunesFix iTunes Cleaner on Windows PC. More importantly, it has much more perfect cleaning features for iTunes. You can preview and select only unwanted files to clean. Various Data Supported: iTunes media, iOS backups, iTunes/iOS software updates, copies of iOS apps, cache, cookies, logs and other junk. Offer you deeper iTunes junk cleaning feature that erases hidden iOS backups made by third-party apps or tools. Remove corrupted/crash/damaged files from iTunes to speed up your iTunes or computer performance. 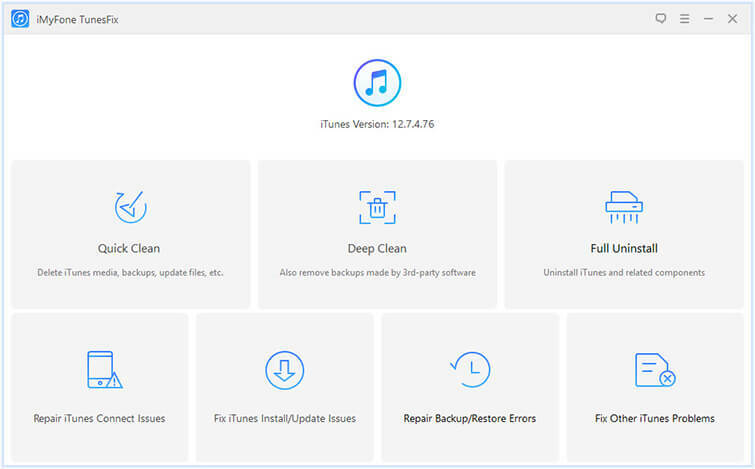 Fix over 100 iTunes errors such as install, restore, connect, backup, and other issues, without data loss. Step 1: Download and install iMyFone TunesFix on your Windows PC. Launch TunesFix and it will detect your iTunes. If your iTunes has no issues, you’ll be directed to the Home interface. Difference between “Quick” and “Deep”: Deep Clean will also scan hidden backups left by 3rd-party software while Quick Clean just finds out backups made by iTunes. Of course, “Deep” takes more time to scan. 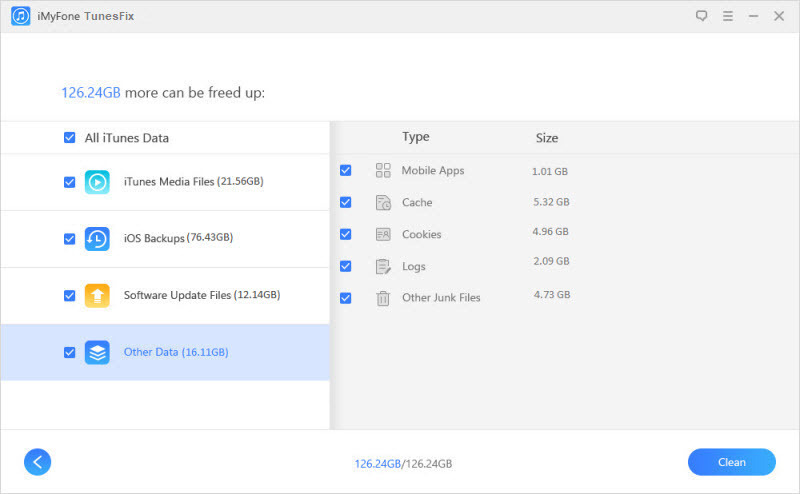 Step 3: Preview and select unwanted data, especially those useless files in “Other Data” category. Then click “Clean” to start deleting your iTunes useless files. Which iTunes Cleaner You Prefer to Choose? Clean cache, cookies, logs, etc.